Yesterday The Fabulous Man and I had our third wedding anniversary. Great, isn't it? Sometimes I can't believe time is going by so quickly, and at other times it feels as if we've been together forever. It's true what they say: The married life is indeed the good life. We decided that for our anniversary we wanted to go to the Australian Open, the Grand Slam tennis tournament in Melbourne each year. We got tickets, the Little Girl was dropped off at her aussie grandmother's house for the day, and we caught the train into the city (just the train bit for me was an outing - I'm a cheap date these days). Roger Federer is my all time favourite tennis player. He is friendly, has a great sense of humour, a beautiful wife and twin girls, and, of course, a South African mother. Did you know that? And, I'm sure you'll agree with me, it's obviously these South African genes of him which doesn't only make him an all round great guy, but also one of the greatest tennis players of all times. Yesterday he played against his fellow countryman Stanislas Wawrinka, aka Stan the Man, aka Cheese Boy (as dubbed by the slightly tipsy girl sitting behind us, damn that delicious bubbly pink moscato), and it was an experience. 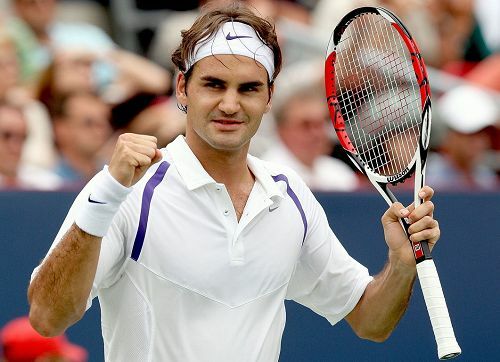 One of the great things about mr. Federer is how easy he makes it all look. To my (admittedly untrained) eyes, it seemed as if he was out there just hitting a few balls, trying out a couple of shots, while poor Cheese Boy was running around like a mad thing trying to get to the ball. I felt really sorry for him. It's a pity, because I really liked the look of him in the earlier rounds, and I also like supporting the underdog. Unless the underdog is playing Roger Federer. Then he's on his own. I can back up my South African mother theory by looking at my Little Girl. This girl has the same sense of humour, friendly nature and staying power than mr. Federer. In fact, I'd like to challenge him to try and keep up with her running around and climbing onto anything and everything all day long. He might be the world's best tennis player (that Nadal guy is just an imposter, if you ask me), but I think he'll meet his match with her. Now, suppose you are in the unfortunate position of not having a South African mother. Let me tell you what to do. You go into your kitchen and make these wickedly delicious espresso brownies. The recipe is based on the one from the lovely Nigella Lawson (who I believe doesn't have a South African mother either, so you see, all is not lost). They will unfortunately not change your mother's nationality, but they will cause such a massive endorphin rush throughout your body that you won't even care. I know, I'm friendly like that. You can thank me later. I decided to put an espresso spin on the classic brownie, and I did that in two ways. Firstly, you add some chocolate covered coffee beans (I made my own), and secondly you make an espresso "sludge" by boiling down some freshly made sweetened espresso to a very thick glaze, and add this as well. I'm sure I don't need to tell you how good this is, and I'm also sure that I don't need to tell you not to give this to children, unless you want said children to run around like little Roger Federers. 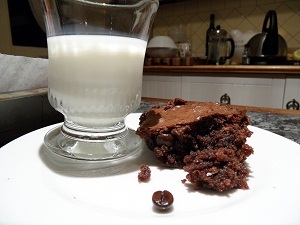 Of course, if your child is half South African, or even full South African, may God give you strength, then you don't need espresso brownies to get them to run around like maniacs. But at least they will be very, very friendly little maniacs. I am sending this recipe to the fabulous new event, Forever Nigella, hosted by the lovely Sarah from Maison Cupcake. The current theme is "Seduced by Chocolate", and I think these brownies are worthy little contenders. To make your chocolate coated coffee beans: Melt the 100g of dark chocolate in a bowl over a saucepan of simmering water, or in the microwave oven if you're feeling brave. Mix in the coffee beans, and spread it out on a baking sheet covered with parchment paper to cool. Chop them up roughly. You want little crunchy coffee bits, not massive hunks. Make a strong espresso with the ground coffee and the boiling water. Add the brown sugar and stir. Pour the coffee into a small saucepan, and boil over high heat until you're left with a thick coffee sludge barely covering the bottom of the saucepan. Let it cool while you get on with the rest of the recipe. Butter and line a 33 x 23 x 5 cm brownie tin. Melt the butter and the remaining chocolate together in a big saucepan. Let it cool for about 5 minutes. Mix the eggs, sugar and vanilla in a bowl. Mix in with the chocolate mixture, then add the coffee sludge, flour and salt, and mix until smooth. Finally add the chocolate covered coffee beans, plus any leftover chocolate left on the baking sheet, and mix just until combined. Pour the mixture into your prepared tin, and bake for 25-35 minutes. Cool in the tin. Yummy! These sound like a real chocolate and coffee hit all in one. An excellent adaptation of a Nigella classic. Thanks for taking part in Forever Nigella! Dit lyk fantasies. Het jy al ooit Nigella se Chocolate Espresso Cake gemaak? Uit Feast. Dis net so heerlik. My husband and I bid on a South Africa trip at an auction this fall and... we got it! Eeek! It is about as far from Seattle as you can get. We will probably visit next Feb or March. I would love to meet you and your family! Sarah, thank you for hosting it! arcadia, ek is indeed getroud met 'n aussie. Ek is nou al 3 1/2 jaar hier. Maar ek mis huis vreeslik. Dana, you lucky thing you! I'd love to meet you and your family too, except I'm living in Melbourne now with my Australian husband. So next time, bid on the Australian holiday! Seriously, I hope you love South Africa. Let me know if you're looking for any travel tips. He he he - no South African genes at all in my family ...so I'd better make them! Happy Anniversary! Your brownies sound perfect, there's nothing better than espresso and chocolate! I love anything coffee-related so these would be a real winner for me! Oh yum! These look so delicious! First of all, that tennis player looks very devilish in a charming way. I understand your fondness for him. Also i love the idea of spiking your brownies with espresso beans, I would have done the same if I wasnt watching my caffeine intake! With the addition of brown sugar, it makes for a rich and delicious brownie. I too love RF. He's the BEST. BTW, I have mailed you a reply on soaking rice. But am not sure whether you have received it. If possible do let me know,as my mail is giving me problems these days. Congrats on your anniversary, we recently celebrated 30 years! I like the sound of the tweaked brownies. Much respect on making your own chocolate covered coffee beans! Brownies sounds excellent.